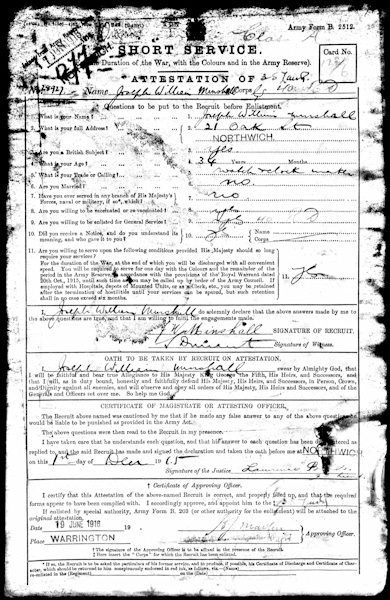 On Wednesday, 1st December 1915, Joseph William Minshall signed his Short Service Attestation form at Northwich, Cheshire. Joseph was born in 1881 at Winsford, Cheshire, the son of George Minshall and Martha Alice Steen. He had an older brother, Alfred, and three younger sisters, Elizabeth, Florence and Frances. Alfred emigrated to the USA in 1907. In 1901 Joseph was living at the family home in Northwich where his father George was a blacksmith, and Joseph a watch and clock maker. The 1911 Census records Joseph in lodgings in Sheffield. Under the Group Scheme, men aged 18 to 40 were informed that they could continue to enlist voluntarily or attest with an obligation to come if called up later on. The War Office notified the public that voluntary enlistment would soon cease and that the last day of registration would be 15 December 1915. Joseph was 34 years old when he signed his attestation. As a single man the group into which he fell had a mobilisation date of 18 March 1916, however he was not mobilised until 17 June that year. On 27 October 1916 he was posted with the 9th Battalion South Lancashire Regiment on the British Expeditionary Force Salonika. Sailing from Marseilles, the Battalion reached the Salonika Field on 13 November 1916. Joseph was wounded on 25 April 1917 during the Battle of Doiran, and died two days later. Joseph William Minshall and Thomas Brookes Minshall, both of Northwich, were second cousins and descendents of James Minshall, their great grandfather.